It's almost been one year since Bleach was cancelled and in my opinion, there was no reason to cancel the show. It was still going strong and each week, I couldn't wait for the next episode to air. Bleach had 16 seasons and in that time, aired 366 episodes. To this very day, it is still one of the most bought Shonen Jump manga comics in Japan and in the United States. So why did they cancel the show? Why did the series end? Was it the ratings? Was it money? Was the anime getting too close the manga? Honestly, I don't know. It could have been any of those things and possibly a number of different factors, but there really isn't any single conclusive answer as to why the anime ended that has been made public (to the best of my knowledge). And with girls like this helping, anything is possible! Bleach follows the adventures of a fifteen-year-old named Ichigo Kurosaki who is gifted with the unwanted power of being able to see spirits stuck in this world. 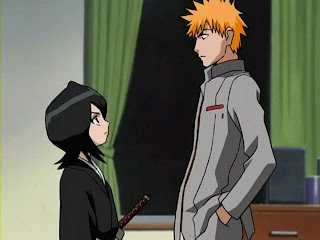 One of those spirits is Rukia Kuchiki, a soul reaper whose duties in the Soul Society are interfered with by Ichigo. When Rukia is injured by a Hollow (evil spirit) that attacks Ichigo's home and family, Ichigo is then forced to temporarily borrow her powers to defeat the Hollow. The next day, to Ichigo's surprise, Rukia shows up at Ichigo's school as a normal school girl and tells him that she has lost all of her powers and accidentally transferred more power to him than she intended to. She cannot carry out her task as a soul reaper and Ichigo must take her place in Karakura Town while she recovers. He must guide souls to the afterlife and defend people from the attacking Hollows. For me, this story arc of the show was a good buildup and a great introduction to the great characters that I know and love. It was only twenty episodes long, so please give it a chance. I think you, the readers here at Fanboys Anonymous, would enjoy it. Next time, I will go over some more of the major characters and cover what is one of my favourite story arcs in the series: the Rescue arc. If you can't wait until then, you know what to do...watch the show!